The following are the terms and conditions on which blooddonors.in offers you access to its website and services. This Agreement describes the terms and conditions applicable to the site user and user of our services at blooddonors.in. We may amend this Agreement at any time by posting the amended terms on our site. Except as stated below, all amended terms shall automatically be effective immediately. This is a binding agreement between blooddonors.in and the user. This Agreement governs the use of the blooddonors.in Web site, including, without limitation, all content such as databases, text, information, images, and audio and all services made available to the users through the blooddonors.in Web site by us and/or third parties. Our services are available only to individuals (excluding minors) who can form legally binding contracts under applicable law. If you do not qualify, please do not use our services. Further, our services are not available to temporarily or indefinitely suspended blooddonors.in users. The content consists of copyrighted works proprietary to blooddonors.in or to third parties who have provided us with content. You may download and print a single copy of the content solely for your use in connection with your internal non-commercial use. Any content you download or print may not be altered in any way and must contain all copyright and proprietary rights notices that were contained in such content. Any unauthorised or unapproved use of any of the content constitutes copyright infringement and subjects the user to all civil and criminal penalties provided for under domestic and international copyright laws and treaties. Personal Information of user Personal Information is defined as any information you provide to us. You are solely responsible for such personal information, and we act as a passive conduit for receiving and processing your requests based on your personal information. (7) shall not create liability for us or cause us to lose (in whole or in part) the services of our ISPs or other suppliers. The site & certain services will be accessible to users of the website as identified in the Registration Forms. All user information provided to us, including without limitation the information on the Registration Forms, must be current, accurate, and complete. If we at any time discover any error or omission in the information you provide to us, we may, at our option, terminate the right to access and use the site by any user. The user/user's are responsible for the acts or omissions by the use of the site, and for any damages incurred by the user as a result thereof. You as the user and blooddonors.in are independent contractors, and no agency, partnership, joint venture, employee-employer, franchiser-franchisee or other business relationship is intended or created by this Agreement. 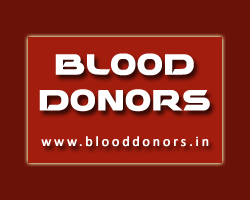 blooddonors.in owns all worldwide rights, titles and interests in and to the site. You may create a bookmark in your browser to the home page of the site. Otherwise, you may not create a link to the site without our prior written approval. All rights not expressly granted in this Agreement are reserved to us. No other rights or licenses, whether express, implied, arising by estoppel, or otherwise are conveyed or intended by this Agreement. To facilitate your access to and use of our site or portions thereof, we may make certain software available to you. The terms of your use of such software will be stated separately in a license agreement that will be included with the software. You agree to only use such software in a manner permitted pursuant to such license agreements. You agree that you will not use any robot, spider, other automatic device, or manual process to monitor or copy our web pages or the content contained herein without our prior expressed written permission. You agree that you will not use any device, software or routine to interfere or attempt to interfere with the proper working of the blooddonors.in site. You agree that you will not take any action that imposes an unreasonable or disproportionately large load on our infrastructure. Much of the information on our site is updated on a real time basis and is proprietary or is licensed to blooddonors.in by our users or third parties. You agree that you will not copy, reproduce, alter, modify, create derivative works, or publicly display any content from our website without the prior expressed written permission of blooddonors.in or the appropriate third party. Without limiting other remedies, we may immediately issue a warning, temporarily suspend, indefinitely suspend or terminate your volunteer entry and refuse to provide our services to you: (a) if you breach this Agreement or the documents it incorporates by reference; (b) if we are unable to verify or authenticate any information you provide to us; or (c) if we believe that your actions may cause legal liability for you, our users or us. Your right to access and use the site immediately terminates without further notice upon your breach of this Agreement. We may terminate this Agreement and/or your right to use the site at any time, with or without cause. We reserve the right to discontinue or make changes to the site at any time. We at blooddonors.in are dedicated to protecting the privacy of our users. We and our associates provide blooddonors.in website and services "AS IS" and without any warranty or condition, express, implied or statutory. We and our associates specifically disclaim any implied warranties of with respect to any product or service. (3) the unauthorized or unlawful use of the site by any other person using your identity. Any contraversy or claim araising out of or relating to this agreement or our services shall be settled by binding arbitration in accordance with the commercial arbitration rules applicable to Tamil Nadu. Any such controversy or claim shall be arbitrated on an individual basis, and shall not be consolidated in any arbitration with any claim or controversy of any other party. The arbitration shall be conducted at Chennai, TamilNadu, India and judgment on the arbitration award may be entered into any court having jurisdiction thereof. Either you or blooddonors.in may seek any interim or preliminary relief from a court of competent jurisdiction at Chennai, India necessary to protect the rights or property of you or blooddonors.in pending the completion of arbitration. We do not guarantee continuous, uninterrupted or secure access to our services, and operation of our site may be interfered with by numerous factors beyond our control. Headings are for reference purposes only and in no way define, limit, construe or describe the scope or extent of such section. Our failure to act with respect to a breach by you or others does not waive our right to act with respect to subsequent or similar breaches. This Agreement sets forth the entire understanding and agreement between us with respect to the subject matter hereof.